Hello. My name is Deb. I'm a UI/UX Designer living in San Francisco. I enjoy solving puzzles, untangling knots, and making complex tasks feel easy. Having worked in companies of all sizes on both enterprise and consumer web applications, I bring deep experience in taking designs from concept to completion. 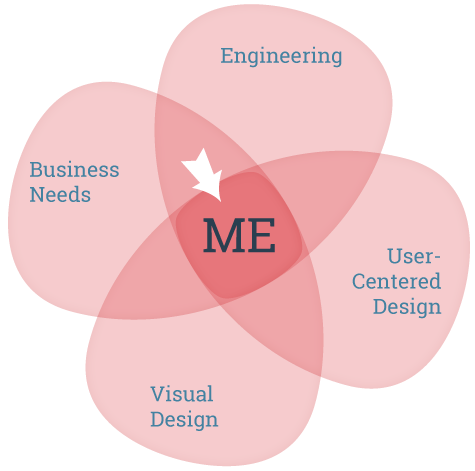 I contribute to both the UX (information architecture, interaction design, usability) and the UI (visual design, look and feel, implementation), and like to be involved in all phases of feature development. This includes working closely with Product Managers/Owners to understand requirements as well as Engineering to offer initial prototypes, assistance during development, and feedback on implementation. When we encounter obstacles, I collaborate across teams to find a solution that fits our requirements for time, quality, and scope. It is a poor workman who blames his tools. I'm a big fan of paper, cardboard, and anything else that can be scribbled on, as long as it helps communicate ideas. Processes are not hard and fast, but should be flexible and adapt to fit the team you're working with and the feature you're working on. Iterating is good, as long as we don't abandon our long-term goal for short-term gains. We don't have to address every edge case or even every use case right away, but we should think of all the edge cases so we agree on what we're choosing to ignore. Yes, one pixel does make a difference, if it's the wrong pixel. The devil is in the details, and I sweat the small stuff. I use a PC. If most people will view web applications on a PC, it makes sense to view it from their experience while designing and developing. I'm the type who turns dollar bills to face the same way in my wallet and restores order to items on grocery store shelves. I like my application structure and pixels to be in order, too. Not every website requires a parallax effect and a giant animated hero image. Effects like these (while definitely cool) are ephemeral, while basics are timeless. Having said that, if effects further the user's understanding and delight, they should be incorporated.